September 20, 2017. 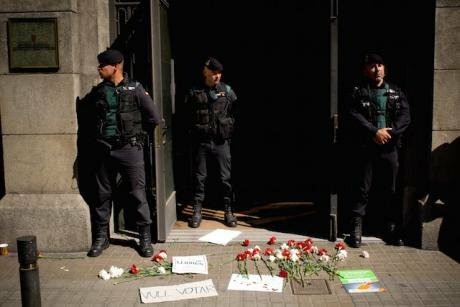 Flowers and a banner reading ' I want to vote' on the floor as Spanish Guardia Civil police officers stand guard close to Catalan Governance Ministry in Barcelona. Jordi Boixareu/Press Association. All rights reserved. When the Spanish Government overturned the Catalan Statute of Autonomy in 2010, even after it had been approved by an ample majority of voters in a referendum that had actually been permitted by the state, I said nothing because I wasn’t Catalan; when the Catalans then asked the state to engage in talks on federalism and the state refused, I said nothing because I wasn’t Catalan; when they asked for a new referendum and were told “we will never even talk about this”, I said nothing because I wasn’t Catalan; when the state denied Catalans any possibility for being listened to, sabotaged their security and taxes, undermined their schools and administration in order to use these as arguments to cover up their own corruption and play the victim, I said nothing because I wasn’t Catalan; when the state throttled their freedom of expression, intercepted their mail and shut down their economy, when uniformed men entered their political organizations and their media, when it confiscated publications, closed websites and arrested mayors, I said nothing because I didn’t read this press and hadn’t voted for those mayors. I even believed they deserved it for complaining so much and hoped they’d be silenced. So when they broke my community’s rules of coexistence, violated my right to control my administration, betrayed my security and used me as cannon fodder I responded but, by then, irrationality had pervaded everything. They only had to say “that’s illegal” and everyone kowtowed. The official media has harped on and on, hammering into people’s heads, all around Spain, the notion that what large numbers of Catalans are asking for is illegal and evil. Prime Minister Rajoy has even said that “what is illegal is antidemocratic”, conveniently forgetting that it used to be precisely the opposite: it’s the power of the people that turns the illegal into the democratic. And if this isn’t so, go and tell the women whose right to vote was denied until very recently, go and tell homosexuals, divorcees, conscientious objectors and other people whose way of life was, for one reason or another, prohibited not so long ago. They’ve instilled the idea that a good part of Catalonia’s population deserves to be crushed, bloodily if necessary, that it deserves police searches, arrests, and outrageous situations such as might be expected of Turkey, or China, or some despicable dictatorship. “They deserve it”: people speak as if these things, these grotesque scenes, were not part and parcel of this Spain which they so fervently desire to see united. I understand. It may look as if Catalonia’s trying to wreck something sacred, namely Unity, something which all the maxims declare is the only recipe for Strength. “Unity is strength”, they say, and may anyone who speaks out against unity burn in hell. But if we think back a bit, the myth of Unity is truly a horror story. History aside, one only has to remember how many lives were destroyed by the indissoluble union of marriage. We now think of this as barbaric. It’s not union that makes strength and, still less, forced union. I’ve spent many years of my life saying that democracy is anything but unity. Democracy is coexistence with differences among separate, free, consenting adult individuals, which is to say among people who are autonomous and responsible for themselves. Catalonia’s only fighting for its rights in its own way. It just wants to stop pleading. It’s truly unsustainable that there’s no way of having a referendum in Spain. I’m not just referring to this one. I mean any referendum. The law decrees that it’s the government that decides whether there can be a referendum or not. And, naturally, the government of Spain always says no. If this isn’t so, go and tell the PAH (Platform for People Affected by Mortgages) which collected one and a half million signatures in a popular legislative initiative (ILP) to change Spain’s foreclosure law and, though an ILP only needs 500,000 signatures in order to be put before parliament, the Government refused to discuss the issue. The bottom line is that, according to Spanish law, any referendum is illegal. But perhaps it might be more accurate to say that certain approaches to governance in Spain are barbaric. The point is not that Catalans can’t have a referendum because the Constitution doesn’t give them this power. It’s that no Spanish people can have a referendum. Not about independence and not about any other matter. Negotiated or not negotiated. Full stop. So what Catalonia is asking for is not just for Catalonia. It’s because the centralism of the powers-that-be in Madrid, and of all the parties that egg them on with the chumminess of parliamentary rituals, ignores the peoples of Spain, using them merely as raw material to extract what they can, regarding them as colonies and even, as we have seen lately with certain questions of security, as cannon fodder (note: the Government excluded the Catalan police from Europol and the Catalan police are not receiving all the information about jihadi terrorists in Catalonian territory). Once more all this is about covering up their own privileges, abuse, and corruption, or simply protecting the patronage networks of each and every party. The enemies aren’t the Catalans who want independence. The enemies are a government and political parties implacable and bull-headed that asphyxiate and trample all over the rest of us. This is why I’ll be one more person voting in and defending the ballot on 1 October. It won’t just be for Catalonia but also for the organised, non-delegated voice that people everywhere should have; I have fought for this all my life. The defence of unity as ideology terrifies me. Old and new parties are founded on the fallacy of ideological unity. They are very unlikely to be the ones who will get us out of this mess if there is no solidarity among people from one end of the country to the other. For years I have been advocating a new kind of politics, one that’s not based on faith and ideology but on people coming together strategically and temporarily to solve the problems they share. People can’t really be together in the name of unity. This can only happen when, respecting the freedom of each and every person, they have interests in common. The peoples of Spain have blood ties and their prosperity and democracy are naturally united. An independent Catalonia isn’t going anywhere, but will only gain the manoeuverability which it has for so long been denied. The central government thinks in terms of subordination. It can’t envisage free people who are able to advance by themselves. I could give a thousand examples but the clearest one is the fact that we are prevented from communicating. There is no Mediterranean corridor and no Atlantic corridor (the roads connections in the circumference of the country, everything must go through Madrid.) This is a preposterous situation which can only be explained by archaic centralism with imperialist predilections. The freedom Catalonia is asking for isn’t a Catalan question. It’s about the freedom deserved by all of Spain’s people. That’s why I’m going to vote on 1 October, and I’m going to vote Yes. I ask, I hope and it’s my fervent desire that, on October 1, the people of Spain won’t revel in state repression, but that they’ll proactively prevent that repression from being executed in their name; that they’ll feel proud of the courage, optimism and the peaceful, orderly vision of the future of their fellow citizens who are carrying out their duty to change the unjust, inflexible laws which are trapping us all.